If you hike the Section 16 trail starting from the Section 16 trail head, in the first quarter mile you will see dogbane as one of the most abundant plants. 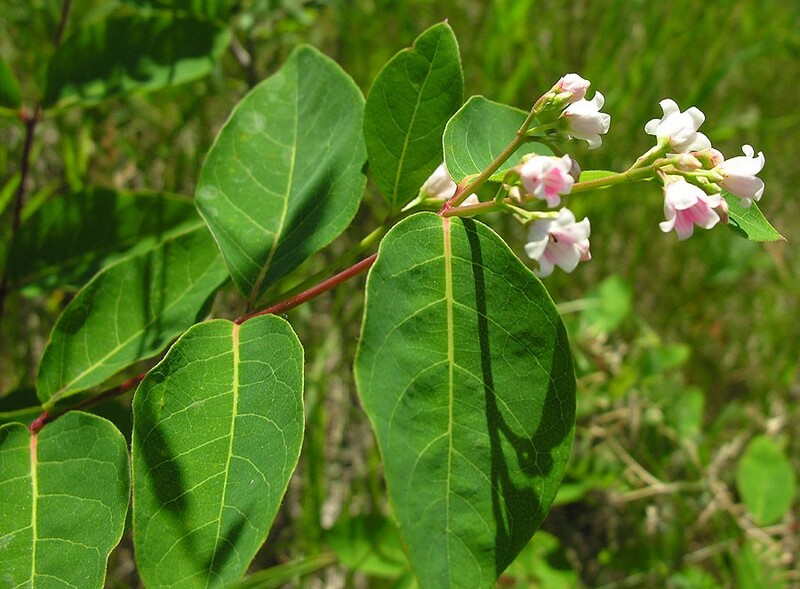 The scientific name for the dogbane genus is Apocynum which means “noxious to dogs.” The plant is distasteful and poisonous to animals; and they usually avoid it. Because dogbane is poisonous to cattle, it is included in that magnificent compendium, Weeds of the West, which was published by the University of Wyoming in 1991. In a most apt description, Michael Moore has called dogbane, “a tidy looking herb.” Its smooth almost oval leaves spaced opposite one another at generous intervals along the smooth, round, rather slender greenish red-brown stalks are decidedly a picture of tidiness in nature’s design of a plant. There are several widely distributed varieties of dogbane which readily cross breed giving rise to a variety of sizes and colors of flowers. Our dogbane typically has numerous pink to white bell shaped flowers which are 1/2″ long or less; and the plant typically grows to around 2 feet tall. Dogbane seed pods are typically over 2 inches long and very slender, opening to release tufted seeds somewhat like milkweed seeds. Dogbane is also similar to milkweed in its milky sap. A 1935 publication, “Uncultivated Native Plants Used as Sources of Food”, by E. F. Castletter mentions gummy latex from Apocynum being mixed with clay and chewed by some New Mexico Indians. In 1928, the Forty-fourth Annual Report of the Bureau of American Ethnology did not mention Apocynum as “food” or “gum”, but described medicinal uses of Apocynum for treating coughs, colds, heart palpitations and earache, as well as its use as a charm. Michael Moore also described medicinal uses for dogbane root in “Medicinal Plants of the Mountain West” (1979), although his list of conditions for which dogbane might be indicated is somewhat different and includes treatment of alcoholism and stimulation of hair growth. Moore cautioned that the variable availability of the pharmacological agents in dogbane and the toxicity of the plant limit its medicinal use. The pithy core of the dogbane stem is surrounded by a strong fibrous sheath. Several tribes have used the strong dogbane fibers to make cords, nets, and cloth. In the Southwest, the fibers were also used for weaving baskets. A few beautiful, and extremely old, dogbane baskets are preserved in museums. These uses of dogbane fibers have given rise to another name for the plant, “Indian hemp.” The name Indian hemp has led to some amusing but potentially dangerous confusion since “Indian hemp” (in this case referring to India) is also a name for marijuana.